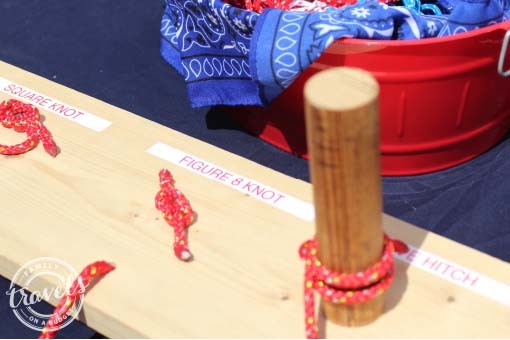 Home » attractions » Blackbeard Festival, family friendly fun! 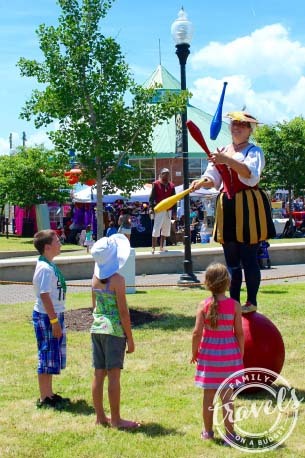 Blackbeard Festival, family friendly fun! Ahoy, mateys! Today’s post is all about the world’s most authentic pirate festival…. 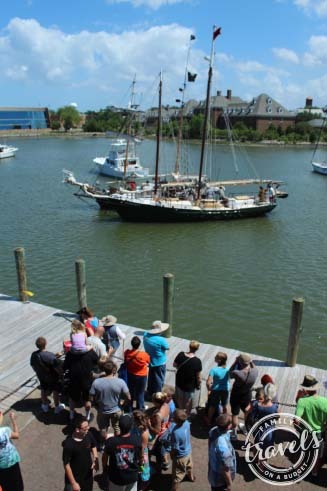 the Blackbeard Festival in Hampton, VA.
1. Jack Sparrow. That’s not to say he won’t make an appearance. Hollywood’s favorite pirate just isn’t the stuff of real pirates. 2. “Goth Pirate.” Until this past weekend, I had never heard the term. But, authentic pirates are not obsessed with black from head to toe or with heavy eye liner. 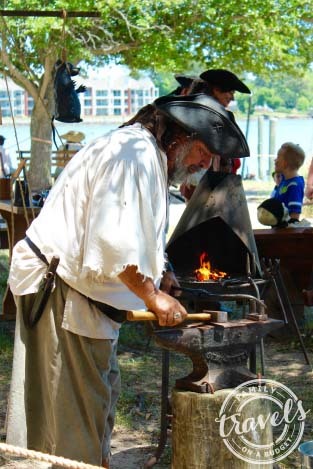 The Blackbeard Festival in Hampton, VA is the real deal. The pirates descend on the town, arriving with tents, cooking pots, bed rolls and stories to tell. 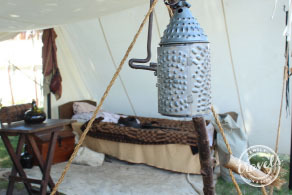 They set up camp along the river, cooking over fire pits, hawking their wares and singing pirate shanties late into the evening. The “main event” happens on Saturday afternoon, with re-enactments of Blackbeard and his crew stealing from merchant ships, the last battle when Blackbeard was killed and the trial of his pirate mates. 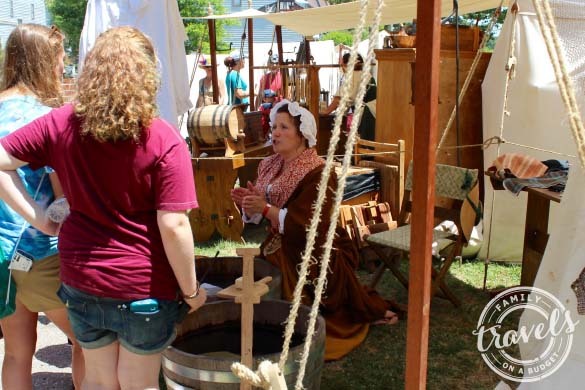 All weekend, festival guests who visit the pirate camp can learn about candle making, the pirate diet, the laundress, the blacksmith, gunpowder and more. 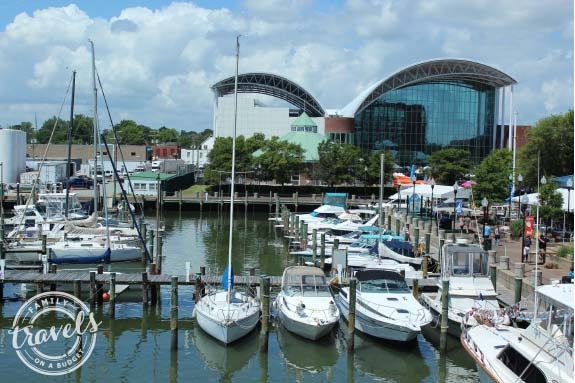 Families with younger kids have their own area on the waterfront, tucked between the harbor, the carousel and the Virginia Air and Space Center. 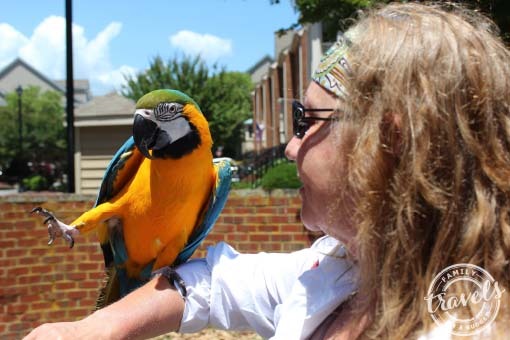 With easy access (two parking garages are nearby), the area has friendly pirates who entertain kids and families and pose patiently for photos. Fair food trucks, children’s activities sponsored by local museums and bounce houses let parents introduce their kids to pirate lore in a memorable, fun way. Meet Jim, from Johnston County, NC (where I live). 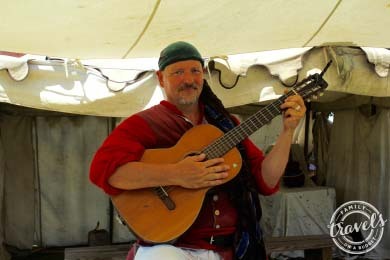 He’s a regular entertainer at the Blackbeard Festival…. and a really nice guy! The highlight of the weekend, at least for me, was the pirate concert at the amphitheater along the waterfront followed by an impressive fireworks display. The waterfront filled with teens (respectful, even), older adults who have been coming to this event for years and young families with excited kids! The young boys sitting to our right exclaimed, “I want this to last forever.” Their cheers as the fireworks wrapped up brought smiles to lots of nearby faces, mine included! Of all the pirate festivals I’ve attended (quite a few), this is my favorite! I got a sense that the pirates really wanted people to appreciate what pirate life is all about. They have invested thousands of dollars in costumes, equipment and supplies. 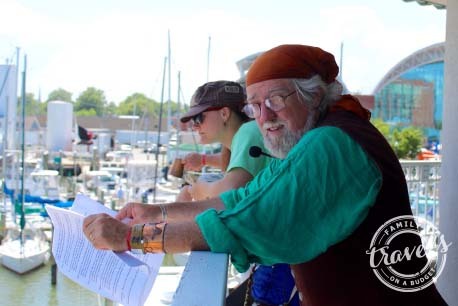 They spend their summers traveling up and down the east coast, sharing the real story of 17th century pirates. Yet, they appreciate that they are there to entertain. They do both quite well. 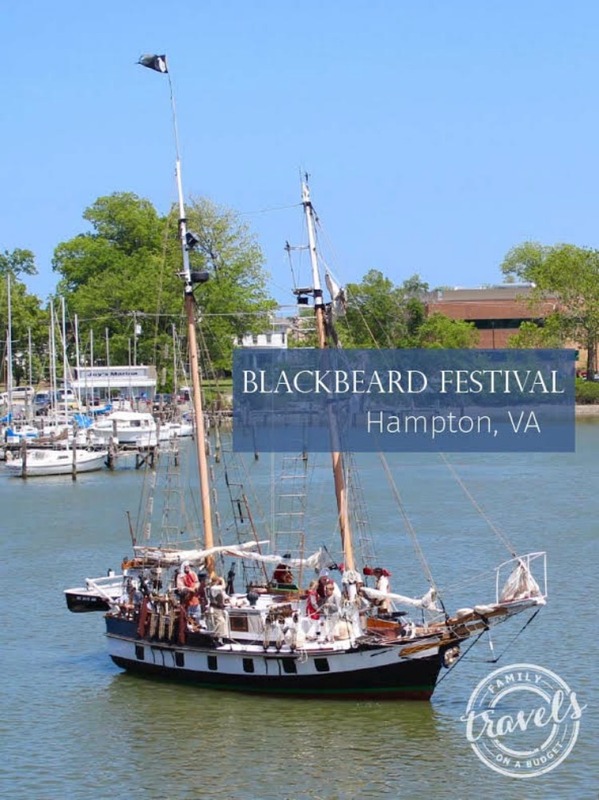 To learn more about the Blackbeard Festival, visit the Hampton, VA CVB site. The festival is scheduled the last weekend of May each year. The best view of the sea battles is from the parking deck next to the Crowne Plaza Hotel. The best view of the fireworks is from the waterfront behind the outdoor pavilion (at the pirate camp). Most food vendors accept credit cards, but cash is handy! 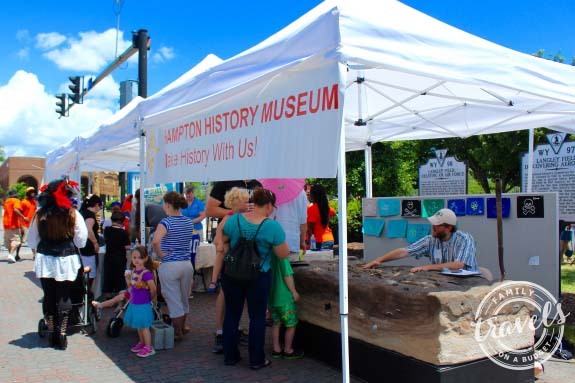 Beat the heat with a ride on the Hampton Carousel in its air-conditioned pavilion or a visit to the Virginia Air & Space Center during the afternoon. Wow. I would love to take the grandkids to something like this. So cool. Sounds like so much of fun. Pictures are very beautiful. It seems like you had a great time with the family. The pirate tents looks so cool. I have never been to pirate festival before, will have a look into it. Looks like a BLAST! My son would go nuts, he’s really taken an interest in pirates lately. I’m sure my husband and I would enjoy it, too! This sounds like an amazing family event indeed to learn about the pirates life back then. It would be so much fun to watch the battle as well. Thanks for sharing. This looks like so much fun for the whole family! I would love to see the pirate battle reenactment. That looks like sooo much fun! I would love to attend a pirate festival. I wonder if there is one anywhere near me?? I have to look into it. Sounds like a great event and your pictures are awesome! This looks like such a fun event to attend. That pirate tent looks so cool! How fun! We’ve never been to a pirate festival, but I’m sure my family would love this. Lovely to see so many people dress up as pirates and having such a festival. Must have been fun to attend. That is a super cool attraction. I saw a few pirate ships when we were in the Cayman Islands. They were giving tours of the area in an old pirate ship. That is really so much fun! I wish I was there lol. I would love to visit there one day. how grand! The festival looks like an expensive movie set woohoo. Glad your family had an awesome time. Great photos too. Wow, that is such a cool event! 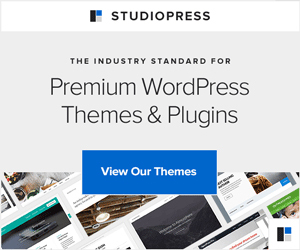 I had no idea this existed! That reenactment sounds awesome. This would be so much fun. My six year old dresses up like a pirate alost daily, although he is obsessed with the “Jack Sparrow” character. We would love to see a reenactment. I didn’t take his photo as he was busy posing with kids — and I try not to post photos of other people’s kids on my site. What an amazing amusement park! I love it! Wish we had one near us! My son was a pirate for Halloween one year, he’d have a blast! Sorry if I was unclear, but this was a weekend festival, not an amusement park. 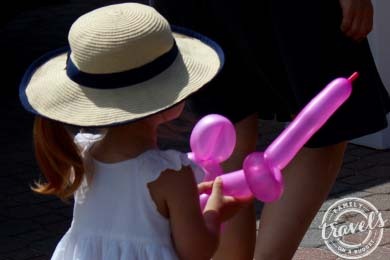 It’s an annual event each May in downtown Hampton, Virginia. This is where Blackbeard was finally stopped, so that’s why the festival is held here. You’re right, though, your son would have a blast! It’s really kid friendly! That sounds like SO.MUCH.FUN!!!!! My kids would absolutely LOVE this. It’s the best pirate festival ever! AND, it’s free! I hope you get to go next year.